- ⛱ KEEP YOU DRINKING COLD ALL DAY - Degbit BPA free drinks water bottles are double-walled and vacuum insulated. When the containers are insulated, nothing external can affect the contents. Our metal water bottles have been proved to provide the best insulation for your drinks, whether cold cola or hot coffee. Hot drinks last up to 8 hours, and cold drinks up to 20 hours. 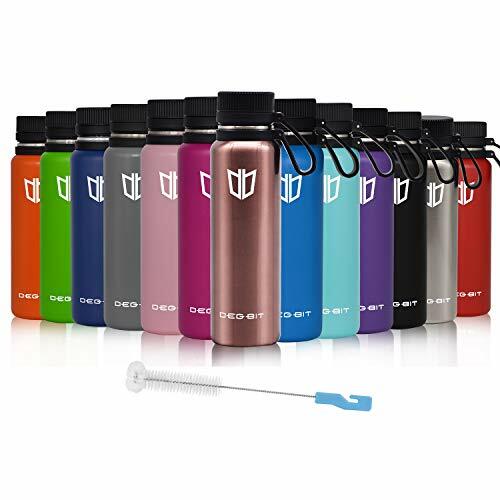 - ⛱ ADVANCED THERMAL SPRAYING PROCESS - Every Degbit stainless steel insulated water bottle undergoes this process to provide it with a powder coating, which gives the container a textured, vibrant, scratch-resistant finish and a solid grip. Annoying peeling paint issues will never happen again! - ⛱ SAFETY IS TOP PRIORITY - We are committed to meeting the highest safety standards for all of our Thermos Flask bottles. Degbit travel water bottle is made from premium food grade 18/8 stainless steel, which is highly resistant to corrosion and rust, and extremely durable. All of the drinking bottles are BPA free and FDA approved, you will never need to worry about any harmful substances like BPAs with the drink! - ⛱ PORTABLE LOOP-TOP CAP DESIGN - Each Degbit bike water bottle has a matching loop-top cap, it's easy to carry to any occasion and the troublesome thing of losing the cap will never happen to you. 3 sizes and 13 colors are available to choose from, you can get everyday hydration needs in one container. The funky designs will also keep you looking cool. - ⛱ SHOPPING WITH CONFIDENCE - We offer no-hassle after-sales service to our clients: if any manufacturing defects are found or damages occur during transportation, we offer a warranty and make sure you are 100% satisfied. A MUST HAVE sports water bottle for gym, yoga, runners, athletes, MMA, crossfit, travel, hiking, cycling, tennis, camping & office work.